Rep. Jerrold Nadler, D-N.Y., said the House Judiciary Committee wants to review documents from the Justice Department, the president's son Donald Trump Jr. and Trump Organization chief financial officer Allen Weisselberg. WASHINGTON, Pa. — Declaring it's "very clear" President Donald Trump obstructed justice, the chairman of the House committee that would be in charge of impeachment says the panel is requesting documents Monday from more than 60 people from Trump's administration, family and business as part of a rapidly expanding Russia investigation. Rep. Jerrold Nadler, D-N.Y., said the House Judiciary Committee wants to review documents from the Justice Department, the president's son Donald Trump Jr. and Trump Organization chief financial officer Allen Weisselberg. Former White House chief of staff John Kelly and former White House counsel Don McGahn also are likely targets, he said. "We are going to initiate investigations into abuses of power, into corruption and into obstruction of justice," Nadler said. "We will do everything we can to get that evidence." Asked if he believed Trump obstructed justice, Nadler said, "Yes, I do." Nadler isn't calling the inquiry an impeachment investigation but said House Democrats, now in the majority, are simply doing "our job to protect the rule of law" after Republicans during the first two years of Trump's term were "shielding the president from any proper accountability." In a tweet on Sunday, Trump blasted anew the Russia investigation, calling it a partisan probe unfairly aimed at discrediting his win in the 2016 presidential election. "I am an innocent man being persecuted by some very bad, conflicted & corrupt people in a Witch Hunt that is illegal & should never have been allowed to start - And only because I won the Election!" he wrote. Nadler's comments follow a bad political week for Trump. He emerged empty-handed from a high-profile summit with North Korea leader Kim Jong Un on denuclearization and Trump's former personal attorney, Michael Cohen, in three days of congressional testimony, publicly characterized the president as a "con man" and "cheat." Newly empowered House Democrats are flexing their strength with blossoming investigations. A half-dozen House committees are now probing alleged coordination between Trump associates and Russia's efforts to sway the 2016 election, Trump's tax returns and possible conflicts of interest involving the Trump family business and policy-making. The House oversight committee, for instance, has set a Monday deadline for the White House to turn over documents related to security clearances after The New York Times reported that the president ordered officials to grant his son-in-law Jared Kushner's clearance over the objections of national security officials. Nadler's added lines of inquiry also come as special counsel Robert Mueller is believed to be wrapping up his work into possible questions of Trump campaign collusion and obstruction in the Russia's interference in the 2016 presidential election. In his testimony, Cohen acknowledged he did not witness or know directly of collusion between Trump aides and Russia but had his "suspicions." House Minority Leader Kevin McCarthy, R-Calif., on Sunday accused House Democrats of prejudging Trump as part of a query based purely on partisan politics. 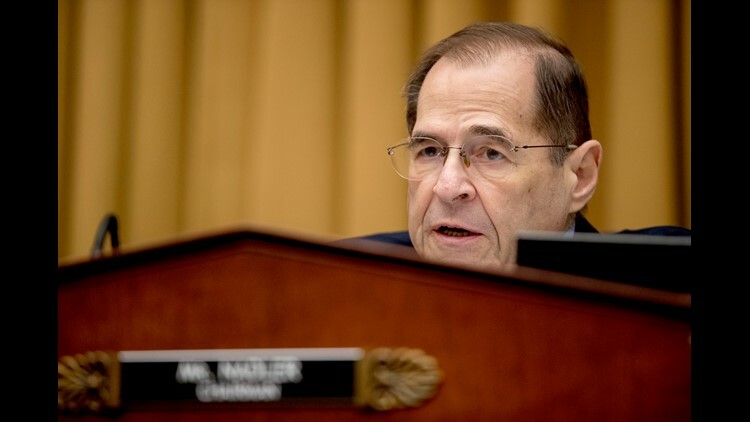 "Show me where the president did anything to be impeached...Nadler is setting the framework now that the Democrats are not to believe the Mueller report," he said. Nadler said Sunday his committee will seek to review the Mueller report but stressed the investigation "goes far beyond collusion." He pointed to what he considered several instances of obstruction of justice by the president, including the "1,100 times he referred to the Mueller investigation as a 'witch hunt'" as well Trump's abrupt firing of FBI director James Comey in 2017. According to Comey, Trump had encouraged the then-FBI director to drop an investigation into former national security adviser Michael Flynn. Trump has denied he told Comey to end the Flynn probe. "It's very clear that the president obstructed justice," Nadler said. House Speaker Nancy Pelosi, D-Calif., has kept calls for impeachment at bay by insisting that Mueller first must be allowed to finish his work, and present his findings publicly — though it's unclear whether the White House will allow its full release. Rep. Adam Schiff, D-Calif., who chairs the House intelligence committee, on Sunday also stressed that it's too early to make judgments about impeachment. "That is something that we will have to await Bob Mueller's report and the underlying evidence to determine. We will also have to look at the whole body of improper and criminal actions by the president including those campaign finance crimes to determine whether they rise to the level of removal from office," Schiff said. Nadler and McCarthy spoke on ABC's "This Week," and Schiff appeared on CBS' "Face the Nation."